So many stories! Let me back track. I left for SAFF on Wednesday instead of the normal Thursday. Our start time, open-to-the-public, was Friday at 9 am. If it takes nine hours drive time to get there, I don't get enough time to fully setup Thursday night if I leave Thursday morning. So by leaving Wednesday night around 5 pm, I get there by noon on Thursday with plenty of time and no pressure to rush. It was 26° in the mountains at the rest area Wednesday night. I was toasty, wrapped in wool. After that, every subsequent night felt warm! I was across the aisle from where they put me in past years. I like being on the end of a row. It gives me more frontage for displays. I laid out the booth on paper before I left home. Only one idea failed when setting up. It worked out much better without running two boards between two tables like a table extension. Instead, I stacked two empty plastic tubs and covered them with a tablecloth. The Folkwear patterns rested on top. Perfect fit! The wire rack with linen thread faced the back aisle. This allowed me to utilize the space without my chair and checkout area blocking people from the merchandise. It felt like there were a lot more attendees, even on Friday in the pouring rain. Yet at the same time, not too many that you couldn't hold a conversation and finish it before waiting on a new customer. Every customer had a story. My head is full of stories which will soon disappear like last night's dreams. 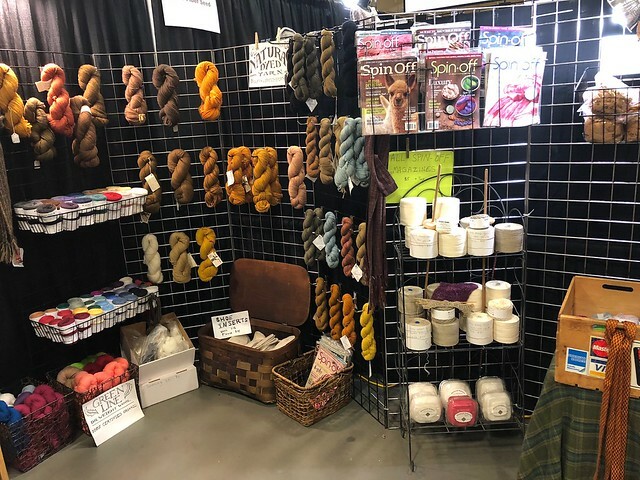 I heard about classes at other fiber shows. Carol James, whose Sprang books I carry, is making a lecture/teaching tour of the US. Several folks bought her book ahead of time to study it before a class in Utah, and probably other locations as well. I met Carol at Pennsic, where she gave a lecture on archeological sprang finds. John Mularky has recommended my bone shuttles in all his classes around the US. So naturally, I am almost out of stock. I really appreciate the publicity! He didn't make SAFF this year but has in years past. So many SCAdians showed up to say howdy! More and more mundane matters prevent them from attending their usual SCA events. So it was very good to see them. I also got to see my regulars from SAFF. I was a little concerned because there were so many weather disasters that hit North Carolina. I was afraid it would keep people away. Last week there was a micro-burst at LEAF and many patrons and artists bailed. Their tents were gone. Hurricanes, flooding, tornadoes, what a year! 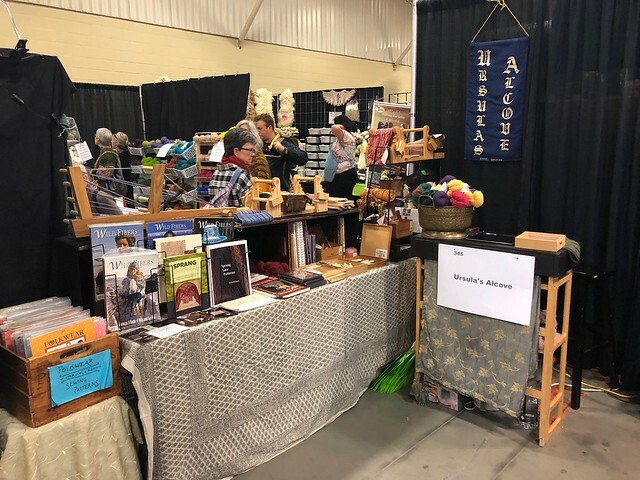 I had a gentleman come into the booth wearing a brown plaid flannel jacket that was every shade of wool yarn I had dyed with natural dyes. I commented on his color choices. Apparently, he came into the booth to be camoflauged. We had a laugh. 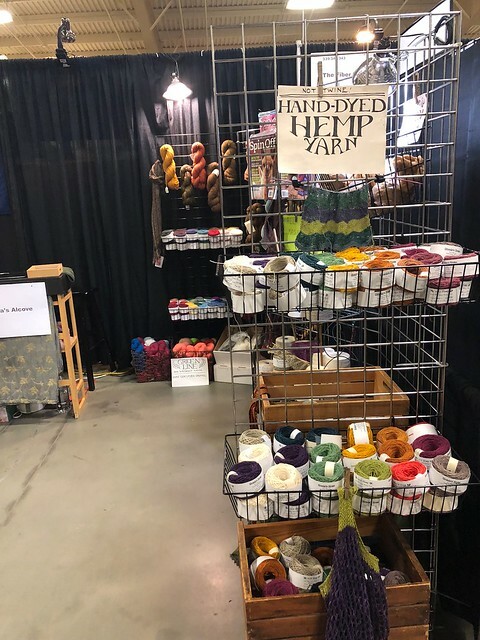 The hemp display was a hit. Next year I need to write up simple washcloth patterns based on what you can knit with one ball. Maybe even display some as gift ideas. The displays sparked many conversations with other dyers. I especially am eager to remember and try an early 1800s recipe to get a colorfast pink from pokeweed. Apparantly there is a memory poem about wool in a pumpkin with pokeberries hidden in a raspberry patch. If I understood it correctly, you cut the top off a big halloween style pumpkin. Scoop out the seeds. Put in the wool and cover it with pokeberries. Put the lid back on. I suppose the raspberry is either the color or where you keep the pumpkin so critters don't get at it. The fermenting pumpkin sets the dye. Keep the wool there until you can no longer stand the smell. Ta-da, colorfast raspberry pink. Another conversation, we were talking about the difference between hemp and cotton. A cotton farmer came in and joined the conversation. We got to learn about growing permits in NC so that your species of cotton doesn't interfere with someone else's. So if you put the effort into getting a pristine white cotton, you don't want your neighbor growing green, lavender or pink cotton and cross pollinating with yours. They need to be grown over a mile apart. This is where the county extension office steps in and issues permits. It was fascinating. Likewise I have lots of speculation to later research for US grown hemp. Hemp is processed like linen. US linen is typically chopped up into 2" bits and is processed dry in cotton spinning equipment. They take beautiful long staple and destroy it, creating tow. That's why all my linen comes from Europe. Europe developed equipment to wet spin flax with its beautiful long, strong staple length (24"). My hemp comes from Romania. It has a 10" to 12" staple length, not quite as long as linen, but they wet spin it without chopping it up. The wet versus dry also makes a big difference. Dry processing makes it look like the yarn is having a bad hair day, very frizzy. Wet processing smoothes it all out so the yarn has no split ends or fuzzy bits hanging out. So when the woman from Colorado came through, we had a nice chat about legally growing industrial hemp and where the harvest is going. I wonder if they'll have to permit that so the industrial and medicinal hemp doesn't cross. I also had a great chat about medicinal herbs. The lady from Texas recommended learning and working with five herbs a year to have their properties really sink-in to your memory. I work with lavender, calendula, plantain, and comfrey. She also had mullein. It doesn't always like our soil. I've seen some growing near the industrial park but not lately. We ended up with a lot of coltsfoot this year. My daughter is working with hyssop, anise hyssop, lemon balm, and sage. I may work on an anti-mold cleaner for the basement with oregano next year. Also had discussions on hemp oil, CBD, THC, arthirtus, turmeric, black pepper, and so many others. Have to send a lady a copy of our turmeric gummy recipe. 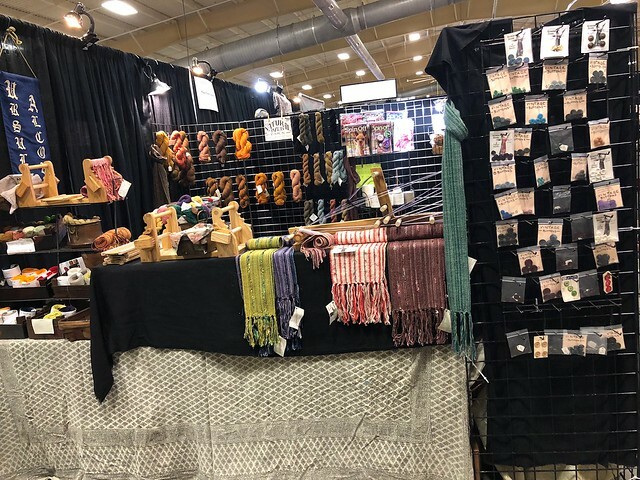 I also talked to other vendors who've gone on Linda Cortwright's fiber tours. She had a fiber center built in the Himalayas in India. I learned you can get a prescription, originally intended for glaucoma, which will offset the altitude sickness. I shared my favorite Instagram account Mongolia_Live. I wouldn't mind doing fiber tourism there. I met a potential supplier for Sprang looms and also someone who may have parts for my old computer. I need a power supply. I also found a gentleman who can repair the walking wheel I have in the garage. And best of all, I got the fixings to make alum acetate for hemp natural dyeing. I want to give it a try. It might just be ecoprinting on fabric to start but depending on the dye plant may work out to dye hemp yarn. My assignment is to read up on it at Earthguild's website. Shh! Don't tell anyone, I splurged. Yes I did. My ball winders have been having a lot of issues lately. They are old and worn out. I wind thousands of balls of yarn a year. My original three winders are almost dead. The electric was such a pain! It cost me over $280 15 years ago. The belt was forever stretching out of shape. You had to take the whole thing apart to replace the belt. New belts were $5 for a 2" diameter black o-ring? I'm pretty sure a center pull ball of yarn shouldn't be tetrahedron-shaped. The plastic hand winder is from Knitting Notions. I really used that one to death! The gears are plastic and totally stripped. Every ball of yarn I sell is wound by hand. My backup plastic ball winder still works in theory, but the guide hook needs to be bent to produce a ball of yarn that is not top heavy. I just didn't have time to tinker with it. So I bought a Strauch "large cake" ball winder. I am to watch his three videos on the care and feeding of it as well as what to do when winding a fussy fiber like silk. My only other purchase was cochineal. Which is incredibly expensive! Hillcreek was there with more helpers in the booth. She also had dried safflower petals to dye with. That's an idea for another growing season. Today I get to rest. Tomorrow stuff goes up on etsy as the van gets unloaded. Whirlwind. Home and safe.